Motor Detariffication simply means that insurance companies are free to use their own method to calculate the price for motor insurance. This means each insurance company can set their own price for motor insurance. iBanding is an independent company that provides education to the Malaysian consumer about De-tariffication to ensure public awareness on the changes from the existing practice to the new. 3. What is Phased Implementation? 4. What to expect after 1 July 2017? 5. What are the impacts to you as a customer? 6. What can you do? 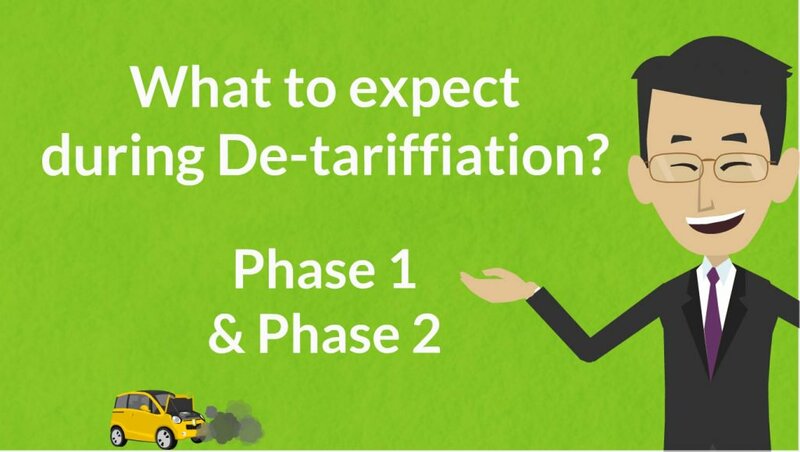 What is Detariffication / De-tariffication? An industry is tariffed if the regulating government body controls the price of its goods/services. While de-tariff means the absence of such regulation by the governing body, concerning price and other terms and conditions. For Malaysians, perhaps the best example of a tariffed good is the petrol and diesel for our vehicles. The prices of these products are controlled at all times by the government. A de-tariffed example is Nasi Lemak. Every shop owner sets their own prices and decides how much to charge. The shop owner can even charge two people different prices for the same “Nasi Lemak”. For more than 30 years, Bank Negara Malaysia has controlled the prices for car and motorcycle insurance. Because of this control, the price that we pay for our motor insurance is almost the same for any insurance company. It does not matter if you buy your insurance from Allianz or from Zurich. There are some small changes, because of something called loading factors and packaging, but overall they are the same, because of Tariffs. However, this controlled environment has resulted in a gap between premiums collected by the insurance companies and actual claims paid out. 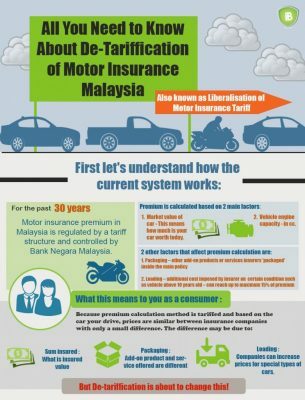 Currently for Third Party Motor insurance, for every ringgit of premium received, the insurance and takaful companies are actually paying out between RM1.30 to RM3.00 in claims, making the Third Party Motor insurance business less and less sustainable. The government has fixed the price for Nasi Lemak at RM 1.00. But buying the ingredients (Rice, Egg, Sammbal, etc.) cost RM 1.30 to RM 3.00. So every time the shop owner sell one dish, the owner makes a loss. The owner can still survive, because the Teh Tarik sells for RM 2.00, but the ingredients cost only RM 1.00. Another reason for Detariffication is that the price for motor insurance should not only depend on the car, but also on the driver’s risk profile. The driver’s risk profile describes how likely a driver is to get involved in an accident. The more riskier a driver is, the higher is the chance to get into an accident. For each accident the insurance company needs to pay for the damages. Risky drivers cost the insurance companies more, so that those driver’s should pay a higher premium. On the other hand, drivers that drive safely don’t cause so many accidents and should pay a lower insurance prices, because insurance companies will need to pay less for claims. A shop owner that sells Nasi Lemak in the shopping mall will have higher cost for rent, electricity,etc. The higher expenses means that the shop owner needs to charge more than another owners that sell Nasi Lemak on the street. 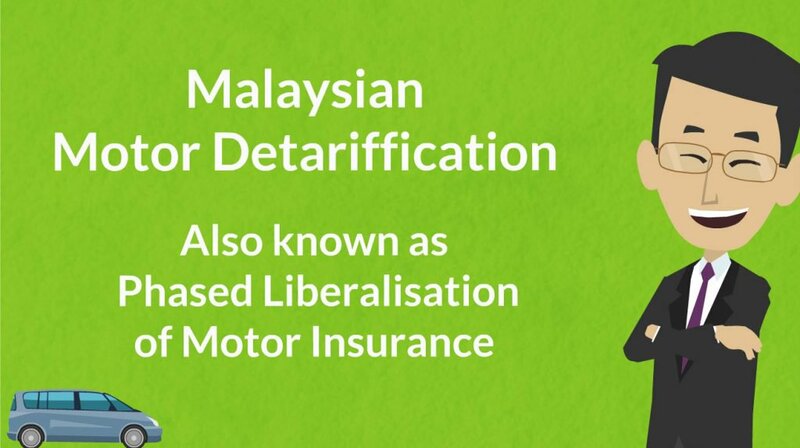 The implementation of Motor De-tariffication will happen in a gradual or phased way (hence, phased liberalisation) – refer roadmap. First phase, 1 July 2016 – Insurers are allowed to introduce ‘tariff-free’ new products at market rates. No changes will be made to the Motor Comprehensive, Third Party Motor and Third Party Fire and Theft. Second phase, 1 July 2017 – The De-tariffication of Motor Comprehensive and Third Party Fire and Theft. Third Party Motor however, will undergo a more gradual adjustment. What to expect after 1 July 2017? 1. Risk-based premium calculation method will be adopted by insurers. This means the insurance price will also look at the driver’s risk profile. Some of the risk factors include: gender, age, years of driving experience, profession, area of residence, type and use of vehicle. 2. New products and add-on covers being introduced to the market that will offer a variety of options to the consumers. 3. Increased competition among insurance and takaful companies which will lead to improved service quality. What are the impacts to you as a customer? b) your vehicle engine size (in cubic centimetre). There are other factors that may affect the insurance price , these are known as loading and packaging (refer following video). Loading and packaging are determined by the individual insurance company hence prices are slightly different. After Motor De-tariffication, each company will do their own price calculation, which may result in large difference in prices. Therefore, it is wise for the Malaysian consumers to start comparing prices before deciding on a purchase. In other words – start shopping around for the best product offered at the best price. 1. Learn about your motor insurance and understand what insurance cover you have. Understanding your insurance today will help you better understand the difference between different policy types and companies. Learn what “Sum Insured” is and know what it is for your own insurance. If you want to learn more, start by reading our article on the different insurance types. 2. Compare prices among insurance companies. A smart consumer will “Shop Around” to find a motor insurance company that offer the right product at the right price. Remember, your risk profile will determine your new insurance price. Each company may think of your risk differently, so that the price for insurance can be very different. You may not have the time to ask for price quotation from all the insurance and takaful companies, but a good insurance agent will be able to help you. Make sure the alarms and auto-locks are working. Install a dash cam. Park your car at a safe location. Before buying a new car, check how much insurance price will cost. Sporty and high performance cars will have even higher insurance prices, because they are more likely to get into a speed accident. Your premium cost will increase if you have made claims in the past. I hope that people will realize that, it (Detariffication) will affect their lives. If they choose to drive more carefully, it would save them money.